In honor of ACP's Centennial, My Kind of Medicine: IM Family is a new series of physician profiles featuring multi-generational Internists. The stories will appear in several issues throughout 2015 to showcase how a tradition of caring and a passion for internal medicine are passed from one generation to the next. "The image of the rural doctor and the practice of rural medicine strike deep and resonating chords within our collective memory as physicians. Rural practice, as characterized by long-term involvement with patients and by positions of respect and leadership within the community, captures an essential part of our professional identity." 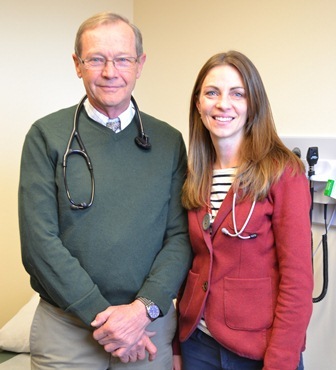 Dr. Ron Loge has lived and practiced rural medicine in Dillon, MT for 35 years. Dillon, the county seat of Beaverhead County—a county the size of New Jersey—is home to wide open spaces, a quarter million cattle and less than 10,000 residents. It is a place where stories about rodeos, cattle drives and blue ribbon fly fishing are the subject of daily conversation. In 1998, one of Dr. Loge's patients, Mary Ann, a woman he had known for almost 20 years, was diagnosed with an inoperable brain tumor. Not wanting to undergo medical treatments that would entail a regimen of strangers, machines, and sterile hallways, MaryAnn chose to spend her remaining days in the comfort of her log home nestled in the mountains, where she could sit in her kitchen, watch chickadees at the window and deer and moose sauntering up to her back porch. To care for MaryAnn and honor her end-of-life wishes, Dr. Loge made weekly house calls, driving 75 miles one way to her home. On his last visit, as he turned into the driveway, fresh snow began to fall. A moose, standing in the yard, looked on as he entered the house. MaryAnn was in a coma. Standing in her kitchen, he watched as the snow fell. Chickadees perched at the window, the moose stood quietly nearby, and in the woods beyond, deer gazed back at him. Nature and her creatures, it seemed, were paying their respects. It is as it should be, thought Dr. Loge; death, not a menacing presence or a battle to be waged in the halls of medicine, but a final journey in a serene and familiar setting. House calls, virtually nonexistent in today's modern healthcare environment, are still part of the fabric in places like rural Montana where the physical distance between patient and physician is often vast. In the course of his career, Dr. Loge believes he has traveled nearly every stretch of road and visited almost every ranch in Beaverhead County. "As a rural practitioner," says Dr. Loge, "the people you take care of are the people you know. They are members of your community that you see in town and sing with in church choir." His daughter, Dr. Anna Loge, an internist who joined the practice three years ago agrees, "It's incredibly personal. I take care of people I grew up with. I get to give back to people who were a part of my childhood-a teacher or a barber who cut my hair when I was eight years old." And when it comes to delivering bad news and providing end-of-life care, Dr. Loge believes there is no one better suited for those responsibilities than a patient's primary care physician. "As physicians," he says, "there's a lot we do to patients, but it's what we do for patients that really matters." A self-described "strong-willed" child, Dr. Anna Loge was determined not to follow in anyone's footsteps. "When people asked if I was going to grow up and be a doctor like my dad, I was very quick to say 'no,'" says Dr. Loge. "Not because there was anything negative about being a doctor," she explains, "it was simply me being my independent self, wanting to do my own thing. So it's kind of funny," she laughs, "here I am a doctor, practicing in my home town, with an office next to my dad." Reflecting on what it was like to be the daughter of a physician, Dr. Loge vividly recalls an incident when her actions caused emergency responders to show up at their doorstep. "As a teenager, I was not allowed to talk on the phone for more than 10 minutes at a stretch because my dad was on call a lot. Back then, we did not have cell phones," she explains, "and being a typical teenager, I had been on the phone for 40 minutes when the police had to come to our house to alert my dad that he was needed at the hospital." But aside from that experience, Dr. Loge says her father's long hours and on-call schedule did not affect life for her and her younger sister, Laura. "He may have missed a piano recital or two," she says, "but our mother was the glue that held it all together, and when Dad had time off, we always did things as a family. We went skiing, fishing, and hiking, and we traveled every year to a different city to attend ACP's annual meeting, which is where my interests in American history, culture, and travel developed." 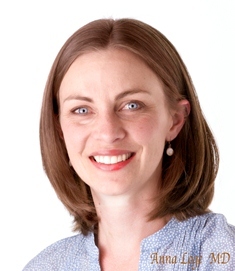 Dr. Loge graduated from Beaverhead County High School as class valedictorian and went on to Williams College in Williamstown, MA where she pursued a broad liberal arts education and earned a bachelor's degree in American Studies. It was during her junior year that she began thinking about the possibility of medical school. "I was taking a lot of science classes and teaching pre-school and realized how much I enjoyed teaching and science." Initially, Dr. Loge thought she would specialize in pediatrics, but during her rotation a 9-month-old child was diagnosed with a brain tumor. "I knew I didn't have what it would take to deliver that kind of diagnosis to new parents," admits Dr. Loge. During her internal medicine rotation, she discovered her true calling. "I loved the process of solving problems and I liked that internists never tired of hearing me ask the question, 'why?'" When she told her father she had switched from pediatrics to internal medicine, he replied, "Of course you did." Laughing about it, Dr. Ron Loge says, "I was not surprised that Anna chose to be an internist. She was surprised, but I knew how her brain worked and I knew her nature. She was curious, a real problem-solver, and great with older people." Like his daughter, Dr. Ron Loge was a curious child. He grew up on a farm in North Dakota, but was not destined for farming. "I was a nerdy kid," he says, "I was always outdoors studying nature and for fun, I would read the encyclopedia Britannica." After getting a bachelor's degree in Chemistry and a master's degree in Biochemistry from the University of Montana, he went on to attend medical school at the University of Oklahoma because he could not imagine life in a lab. "I wanted a career where I would be involved with people." As a child, Dr. Loge was inspired by an older cousin who was a primary care physician. Years later, he read Albert Schweitzer's autobiography, Out of My Life and Thought, and says he knew medicine would be his calling, but it was during his 3rd year of medical school when he met attending physician Dr. Tom Caniglione that he realized he would become an internist. "Dr. Caniglione had spent four years in the National Health Service Corps and he could completely manage a patient's care," says Dr. Loge. "When the subspecialists came around he would discuss subspecialty medicine at their level. He was an incredible role model. I thought, 'that is exactly what I want to do, that is exactly the kind of doctor I want to be.'" Dr. Loge is proud of his daughter's independence and credentials and believes her fresh ideas complement his years of experience. "We are true colleagues," says Dr. Loge, "We always have a dialogue going back and forth on how to provide the highest quality patient care and we cross-cover for each other all the time." In addition to sharing a passion for medicine, the two doctors find life in a rural community deeply satisfying. Both love cross-country skiing and hiking and each has a variety of interests. Dr. Ron Loge enjoys fly fishing, knife making, and Norwegian wood carving, and he is a self-taught scholar of the Lewis & Clark expedition. He and his wife Charlene, a piano teacher, have been married 43 years. 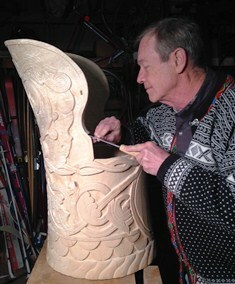 Dr. Ron Loge's current carving project is a Norwegian traditional chair for his grandson that is made from a hollowed out tree trunk and embellished with Viking era dragon motifs. In addition to cross-country skiing, Dr. Anna Loge enjoys downhill skiing, knitting, cooking, and gardening. She and husband Brett Maki have two children ages six and four. Her sister Laura is a talented musician and opera singer who recently cut a CD of Scandinavian art songs, and husband Brett is the owner/operator of Beaverhead Brewing Company, a craft beer brewery in downtown Dillon. In rural communities, the abundant recreational opportunities help to offset the grind of long "on call" hours frequently encountered by rural practitioners. 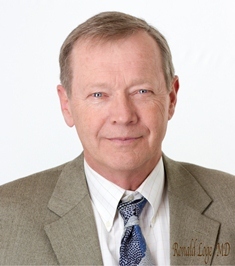 When Dr. Ron Loge began practicing medicine he was on call 24/7 for the first eight years. Thankfully, that kind of service is a thing of the past, but Dr. Anna Loge, who divides her time between doing clinic hours and practicing hospital medicine, does 12-hours of on-call service following her 12-hour shifts at Barrett Hospital. To entice physicians to practice rural medicine, medical recruitment agencies often place ads in medical periodicals with banners that read, "A better life is calling" and "Voted best place to raise a family." What the ads do not reveal is the likelihood there may not be a medical school, trauma center, hi-tech imaging equipment, or any subspecialists within 100 miles. But Drs. Ron and Anna Loge consider themselves fortunate. In Dillon, they have ten primary care physicians and a hospital that is only two years old, and although the hospital is small, it has two general surgeons, an orthopedist, an emergency room, and a radiology service. Most subspecialists are 1-2 hours away, but Dr. Ron Loge loves practicing broad-based medicine and is not troubled by the lack of specialists. The silver lining, he notes, is that such an environment requires him to maintain a high level of expertise in a broad range of areas and procedural skills, and it is a more cost-effective delivery model. For both doctors, a rural community offers more than a scenic backdrop. It is where strong social ties turn a community into an extended family, and where physicians get to practice medicine the way it was intended- up close and personal-a stimulating, intellectually challenging, and rewarding profession. However, both agree there are challenges to practicing rural medicine. "Rural folk tend to be more stoic, many do not have health insurance, and often we see patients with advanced problems," says Dr. Ron Loge. The distance patients have to travel to receive care is an obvious obstacle, and when physicians are such a visible part of the community, they can feel as if they are on call, even when they are not. Despite such challenges, Dr. Loge says, "If I had it to do again, I wouldn't do it differently." In 35 years of practicing medicine, Dr. Loge has witnessed a lot of change-some of it positive, some of it problematic. He is especially pleased with the advent of the digital age and electronic medical records. "We are fortunate," he says, "Barrett is part of a consortium of hospitals that share EHR which has greatly enhanced patient care in our area, and I like that I can go online to get information I need and participate in online consultations." Dr. Loge is far less enchanted by the intrusion of private insurance companies into everyday medical decision making, and what he considers the "abuse of power" by the pharmaceutical industry. "When profit-driven companies manage care," says Dr. Loge, "patients are the biggest losers." For Dr. Anna Loge, the challenges are not what she assumed they would be. "I thought it would be hard to return home as a physician and treat people I had known growing up," she says. "I thought patients might view me as that little girl with curls in 4th grade, but it seems the opposite is true; because they know me, they trust me to care for them, which really is an honor." Her biggest challenge she says is what all working parents face-managing her time, making sure the kids are okay, meals are prepared, and homework gets done. To stay current in the field of internal medicine, both doctors read journals and attend medical meetings. Dr. Anna Loge especially enjoys the collegiality of ACP chapter meetings, and Dr. Ron Loge is an ACP Master who is a former Governor of ACP's Montana Chapter. "ACP helps me keep up to date," says Dr. Loge, "and its policies define what high quality patient care looks like and the internist's place in medicine." Dr. Anna Loge appreciates her father's experience and generosity. "I didn't want to follow in anyone's footsteps," she acknowledges, "but it has been an incredible opportunity to walk next to and with my dad." Despite all the two doctors have in common, there is a noticeable difference. "I'm a hugger," laughs Dr. Anna Loge, "I will hug patients, and I'm more likely to laugh and cry with a patient, whereas my dad is more reserved." In addition to caring for patients, both doctors teach medical students and supervise residents. As a Clinical Professor of Medicine for the University of Washington, Dr. Ron Loge promises his 3rd year medical students, "Working with a primary care physician or internist practicing in rural America you will get an education and experience that can far exceed other medical training opportunities." At the end of their six-week rotations, many of the students are quick to agree. Those who have the privilege to learn medicine from Drs. Ron and Anna Loge discover that practicing in a rural setting unveils what the best of medicine can be.